Pia is rather on the smaller side, with a thin, almost scrawny, frame and a height that doesn’t do much to distinguish her. She clearly takes more after her mother than her much-larger father in that regard. Her left leg is noticeably shorter than the right due to a childhood accident, and she often seems to stand at a slight angle as a result, as well as walking with a pronounced limp. She has tanned skin and dark eyes, as well as wide lips that are almost always turned up in a smile. Her hair is long and dark brown, though not especially thick—which she is slightly insecure about—and she frequently wears it in a braid or ponytail, the end of which often has bits of clay in it. Despite the presence of clay in her hair and under her fingernails, and the fact that she can never seem to get her hands quite clean, Pia is rather proud of her own appearance, and takes pains when she isn’t working to dress nicely in long skirts and dresses. However, when working she accepts the necessity of practicality, and tends toward drab-colored clothing, usually pants and a shirt, that show dirt and wear less easily. On occasion she’ll wear a bandanna to cover her hair as well, but usually she claims that she feels weird wearing anything on her head. Her voice is relatively low-pitched, and with an almost whispery tone, though she hardly lacks for volume. She tends to smile a lot. Pia is a rather bubbly and cheerful young woman, eager to make friends with anyone around her, and not just to prove to herself that she can, but because she genuinely enjoys the company. In fact, she’s actually at her most nervous when she’s alone, and craves company in one form or another, even if there’s only one other person around. However, because she is so desperate for human company, and because she spent much of her life sheltered by her mother, she allows herself to get close to anyone regardless of their motives, and she is both gullible and easily led. She’s extremely polite, always careful not to offend, and seems to assume that other people’s rudeness is the result of her own failings, rather than their lack of manners. She tends to blame herself for a lot of things, even though most aren't her fault at all, and seems to be convinced that most negative things around her are related to her actions. Despite her mother's attempts to shelter her from harm, or perhaps because of them, Pia never learned to grow out of some irrational fears. She is terrified of the dark, always sleeps with a glow next to her pillow, and avoids the less-used and more ill-lit hallways as best she can; when she does have to pass through them, she does so as quickly as possible. She's also afraid of deep water, and never learned how to swim, and despite her mother's frequent reminder that her father is a rider, she's afraid of dragons and refuses to approach them. She has always felt a little guilty that she can't seem to live up to her mother's expectations. She has long since accepted that she is never going to be brave, and will certainly never be a rider, and is entirely happy with pottery, but her mother always wanted more, and she's always wished that she could be a more desirable daughter. With one daughter nearly Turned ten, Bernapia had long assumed that she was, for one reason or another, sterile. After all, if she was able to have more children, she would have done so already. However, a couple of months after she had a brief fling with a bronzerider, D’co, she found that this was certainly not the case, for she was most assuredly once again pregnant. This was wonderful news, of course, and she was very much looking forward to the birth of her second child; she hoped for a boy. Unfortunately, it was a hard birth, and by the end of it the Healers had come to the conclusion that Bernapia would not be having any children past her second, but nevertheless the child was born. She was not a boy. Despite the difficulty in giving birth to her, and despite the fact that Pia was another daughter, Bernapia was delighted to have another child at all, and determined that she would raise her with as much love as she had her older daughter, Beri. She never did inform D’co that he’d fathered her daughter, and if he ever wondered, she would have told him that she didn’t know. After all: everyone knew that riders didn’t make good parents anyway, and Bernapia was quite keen on keeping her daughter safe from any kind of rejection on her father’s part. Pia, of course, was always aware of who her father was. How could she not be, when her mother was constantly reminding her that her father rode bronze, and that if she wanted to, she could do great things someday? Not that she ever told him either; she’d seen him a few times, as she had most people in the Weyr, but only in passing, and that was just the way things were. Though she wasn’t raised in the creche with most of the other children, Pia still never lacked for friends from an early age. She played with all of the other children, it was just that when she wanted help, it was her mother she ran home to. At that time, she was young enough that nobody thought twice when she was frightened of the dark, or didn’t want to ever swim or ride a dragon; after all, children think such things and then grow out of it. There was one boy in particular that she played with often: Pazir. Her mother said that they were two peas in a pod, and not just because of their names, not that the phrase made much sense at all to Pia. Nevertheless, the two of them were usually getting into some sort of mischief. While Beri was busy with her candidacy, having finally become old enough, Pia and Pazir were running around the Weyr, stealing pies whenever they could get their hands on them—pie was Pia’s favorite food—and generally determined to have as much fun as they could. That fun frequently involved getting into places that they shouldn’t, and while Pia wasn’t particularly keen on exploring dark, little-used hallways and rooms, she was quite fond of finding ways up onto the Heights. Once they’d found a path that kept them out of view of the watchriders, Pia and Pazir went up to the Heights as often as they could get away from the watchful eyes of adults. The last time they ever climbed up together, the two young children got into a fight over a shiny rock, which turned into a wrestling match just because mud was fun. Unfortunately, there was always a reason why they weren’t supposed to be up on the Heights at all, and at some point the two children got too close to a cliff edge, and by the time they noticed they were already tumbling down. Pazir died the next day due to injuries sustained in the fall. Pia spent the next few months in bed with a few broken bones, the worst of which was her left leg, and Bernapia vowed never to let her younger daughter out of her sight again. While Pia was bedridden, Beri Impressed to a green on the younger girl’s sixth Turnday, and the half-sisters never really did see much of each other after that. For Turns afterward, Bernapia did exactly as she’d promised herself she would, and was practically never apart from her daughter. Since Pia couldn’t do much else until she healed, her mother started teaching her about Weaving, to keep her mind busy if nothing else. The young girl couldn’t make anything of particular use, since cloth required the larger loom, but she could at least practice making small things on a hand loom. Even after she’d healed, or at least as well as she could, since her left leg never would really heal properly, Pia didn’t really protest at being restricted to her mother’s company. She blamed herself for Pazir’s absence, even if she didn’t really understand death very well yet. By the time she was thirteen however, Pia was finally starting to get at least a little bit of her natural rebelliousness back. At least, she found weaving to be just about the dullest thing in the world, though she kept silent on that point for some time, not wanting to disappoint her mother. She’d noticed for a while that her mother didn’t seem pleased with her sometimes. She’d remind Pia often that her father was a rider and a brave man, so she shouldn’t be afraid of dragons, or the dark, or swimming. Sometimes, she’d suggest that if she tried just a little harder, maybe she’d be able to run more than a few steps. But finally, it got to be too much, and Pia begged to be allowed to do something else, anything else but weaving. That “anything”, in the end, was pottery. After all, her mother had been assured that it was quite safe, and though Pia had thought she might try her hand at herding, at least pottery wasn’t weaving, and that was her biggest concern at the time: getting away from weaving. Instead, for the greater part of most days, she was entrusted to the care of an older man with dusty hands and clay in his long beard, but at least she wasn’t weaving. In time, she even came to find that she was rather fond of pottery, and while it wasn’t as exciting in some regards as she’d imagined something like herding might be, she quite enjoyed making things, and watching a bowl or plate take shape beneath her hands. As Pia started to gradually become more independent, she could tell that her mother was becoming increasingly disappointed with her. Her efforts were no longer met with praise, but with assurances that, in time, she might be able to do better. Bernapia reminded her about who her father was even more often than she had before, but nothing would change Pia’s mind about her fears, or about her choice to continue to pursue pottery. Eventually she Turned fifteen, and it was almost inevitable that her mother approach her about Candidacy, despite the fact that she was neither physically fit for the job nor willing to get within a hundred feet of a dragon. She refused, of course, and for the next few days had to listen to more constant reminders about D’co. The final straw was when, in a misguided attempt to help cure her daughter of her fear of dragons, Bernapia tried to give Pia a fire lizard. This failed, as she ran from the room the moment the tiny creature hatched, and it Impressed to her mother instead. Pia found her own quarters after that; despite fire lizards being tiny, she still found them a little scary, and most certainly did not want one bonded to her. The two haven't spoken much in the Turns since. Was largely terrified of her dragon, and other dragons; dealt with Ryo by thinking of her as a kitten instead. Joined the Healer's Wing upon graduation, and officially apprenticed as a Healer. 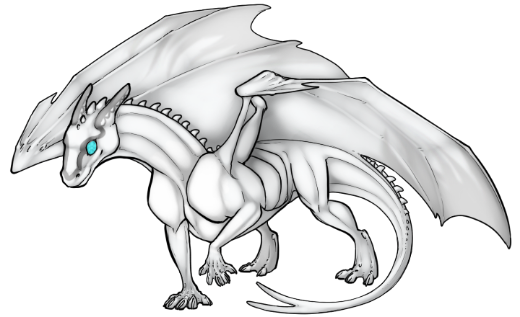 Unlike most of the Wing, most certainly does not specialize in dragons. While she and Ryodath were drying off after the white bathed, the pair were kidnapped and brought to Benden. Ryodath has been under the Benden gold's compulsion ever since, and Pia has been imprisoned. Pia attempted to kill one of her jailers and escape; however, the plan went awry and she was almost immediately re-captured and slated for execution the next morning. A gloating letter was sent to Tuckal. The pair, along with Yasmin and Ssath, were rescued when Tuckal came to stop the execution and get them back. If a smaller white has graced Pern, there's no record of it. Ryodath is positively tiny, short and very delicate-looking. She is never going to grow out of the 'all limbs and ankles stage', and she is very fragile. She's never really going to be a fighter. She isn't very fast, and she isn't very big. She gets tired easily and can't last a whole Threadfall. She's runty, the runtiest runt to ever runt, but there's something rather lovely about her. She is all white, almost blindingly so. The very tips of her wingsails have gray streaks, like something was trying to color over her membranes and turn her another color. There is a darker marking across her face, like a little crown on her headknobs melted over her nose. Ryodath... doesn't speak. Or cannot speak. Or maybe doesn't know how. Her words are just a jumbled, other language that Pern doesn't speak, and she quickly learns it's much easier to pretend she doesn't know how to talk and just communicate with pictures, feelings, and sounds. If she's going to learn how to speak Pernese, she'll need a lot of help. There are bite and claw scars on her right leg, chest, neck, and face from a confused dragon's attack after his rider was injured in a Fall. Her right eye is dark and scarred, no longer changing colors like the left, and she cannot see from it. Ryodath is... well, she tries. She's not very strong, and not very fast, and really can't do a lot of things that other dragons do because of her small size, but oh how she tries. She has a lot of heart, and really wants to do everything that her siblings can do. She's scared of loud noises and the dark, and even when she's full grown will try to hide under a blanket in a thunderstorm. She's gangly and uncoordinated, and she knows that she's not the same, but she tries. With her rider, Ryodath is never going to want to leave their side. She will nip at their sleeve and follow them around holding their hand on her head if she must. She's fairly good at solving puzzles, and can point out how to solve a problem. She sometimes forgets that she isn't as durable as her siblings, and she can't keep up with them all the time, but she will keep trying. Failure will make her extremely sad, though she won't dwell on it. Nani is a good-sized nanny goat. Her coarse fur is mostly cream-colored, with slightly darker tan spots; her face is mostly brown, with cream on her forehead and nose. She has smallish ears, and narrow, medium-length horns with only a slight curve to them. She has a gentle sort of look to her. Nani is a friendly, inquisitive goat who doesn't really seem to be frightened of anything. She lives primarily for two things: attention and reaching the highest possible point she can. The former she acquires by gently headbutting any person or dragon she encounters until she gets what she wants, and the latter is impossible to keep her away from. While goats in general do poorly at staying in pens, she is a veritable escape artist, rarely straying far but usually ending up on top of the stables instead of in them. If she can't manage that, she'll take what she can get by climbing on top of dragons, whers, runners, and even other goats if it comes to it.